This is me and no, I am not doing a parody of Britney Spears MTV performance. I never knew a snake , especially that of a python species can be that heavy until I had that creepy crawly beast over my shoulders. Damn it was one heavy reptilian I tell you. It didnt take that long to slowly find its ways between my legs and body and I DONT mean it in a dirty way. It DID curl and that was my face looking rather stupefied yet thrilled at the same time to feel a snake on my body for the first time in my life. 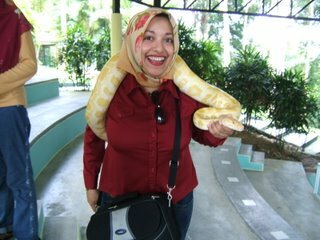 Dont just take my word, how about I dare you to experience it yourself at Langkawi Snake Sanctuary. It is opposite Tok Senik Resort. Their affair is certainly one of those most popular and probably one of the most joked about love stories across the media all over the world. Yet love defies everything for them and they have proven their utmost commitment by exchanging vows and becoming formally lawful wedded husband and wife. They are of course none other than one of the most prominent actors in Hollywood, Tom Cruise and his newlywedded missus, a former teen drama queen of Dawson Creek fame, Katie Holmes. What Bennifer (Ben Affleck and Jennifer Lopez) has failed, TomKat (the nickname supossedly jocular made for Tom and Katie) has proven otherwise. Despite all the constant mockings and widely exposed stories , gossips more likely, have been made up (or true ones but bearing explicitly cynical remarks whenever possible), they managed to stay together. Not to mention that famous stunts in Oprah Winfrey talk show made by Tom Cruise himself that gained millions of attentions across YouTube. You just type his name and that videoclips hit the top list. Not just that, Scientologist Tom Cruise has also proven to the world that he is indeed not THAT sterile after all. What with his obsessions and love-craze with Katie Holmes that they actually were bestowed with a "home-grown" baby girl name Suri. In Malaysia, suri, a sanskrit-origin word, is commonly used to define The Lady in House, as in suri rumah tangga, while permaisuri loosely interpreted as the Queen of the house. May I congratulate Mr. and Mrs. Cruise on their lavish wedding day (last weekend) in a 15th century old castle with a lake view backdrop in Bracciano , 40km north-west of Roma, Italy. Tom, you certainly DO love that woman. Hopefully this third wedding will be more successful in your quest for another Mission: Impossible III.